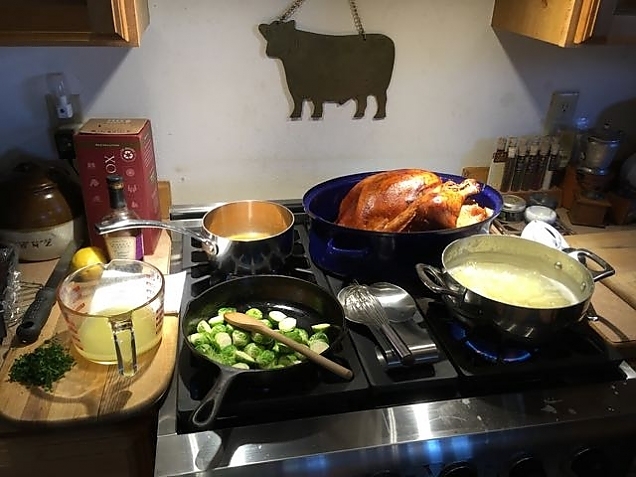 Just a short post about our Thanksgiving. It was a cold day (mid-20s), windy (gusts up to about 30 mph at the cabin), but sunny. We took the dogs for a short walk, then started meal preparations. Somehow, we survive in our tiny kitchen. The main problem we have is counter space. Everything was fantastic except we didn't care much for the brussels sprout recipe we used. We'll use our old standby next time. We took time to talk about what we are thankful for: friends, family, our health, and the opportunity to live our dream at the cabin. We also took time to think about those who are not having the Thanksgiving they probably hoped for, including our neighbor who spent the day in the hospital. We are also thankful that dinner got cooked. We've been having a lot of problems with our new appliances. We love the mechanical designs and functionality. But, their quality suffers. I am becoming quite the appliance repair guy. The oven had been "acting up": at first not starting at all; after replacing a toggle switch it would start but would then go off after some time; an adjustment fixed that but left the oven unable to regulate the temperature; backing off the adjustment seems to have fixed it. We were able to cook several items in the oven and it performed well. The refrigerator is another issue, and a good topic for another time. After all I want to stay positive and thankful in this post! Sounds and looks good!!! 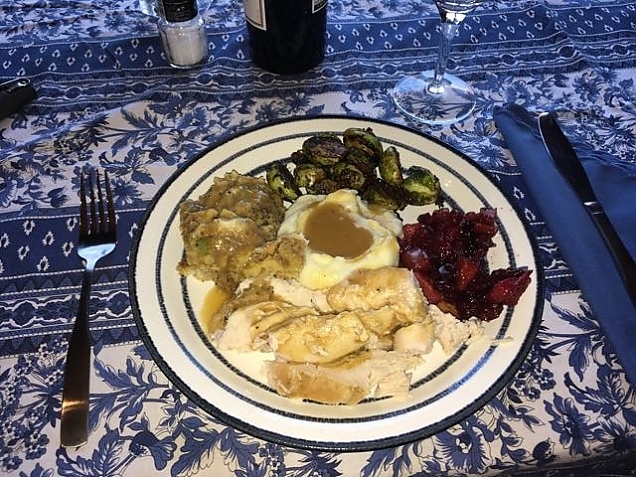 I had brussel sprouts too but a brussel sprout slaw with apples and cranberries, along with maple sweet potatoes and pumpkin risotto all courtesy of Whole Foods!!! And dessert was a pumpkin latte cupcake from Wild Flour Bakery! YUM!!!! Happy belated thanksgiving to both of you. Had a wonderful meal & visit w/ mom, Deb, & les. Even simple temperature regulation systems can be surprisingly tricky. Good luck & be safe! Have a toasty & fun winter! Your Thanksgiving meal looks great, but sorry your brussels were a bust! We had your creamy brussel sprout recipe (the one I ate so much of at your house!) Everytime I make it I forget how much prep goes into it, but totally worth it. Will have leftovers of everything tonight! Next entry: Winter Provisioning is Done!